What do you get when you unleashed a baby and a water fountain together?!! Joy and cuteness to the max!!!! 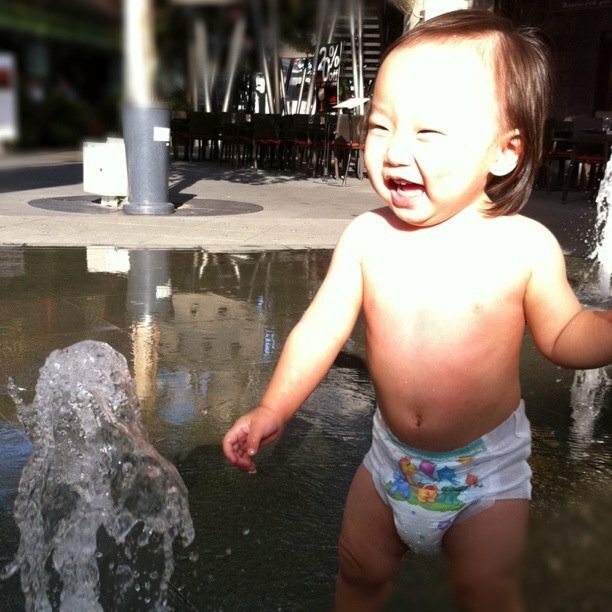 This is him enjoying himself tremendously at a water fountain area in Clark Quay! So there we were walking around when we chanced upon this. At first, when my sis and husband asked if I'll allowed him (Benjamin, not my husband) to play in it, I was hesitant as we did'nt go there prepared to get him wet. So we moved right along. And needless to say, this boy surprised us by dashing straight into it!! He was chuckling and laughing and having so much fun playing with the water. And there was this photographer who asked us for permission to take his photos. And soon, there was this small crowd that had gathered to take his pictures! It was so funny, looking at them take his pictures, man I should have collected royalties, ha! And indeed, I was happy to see him happy!